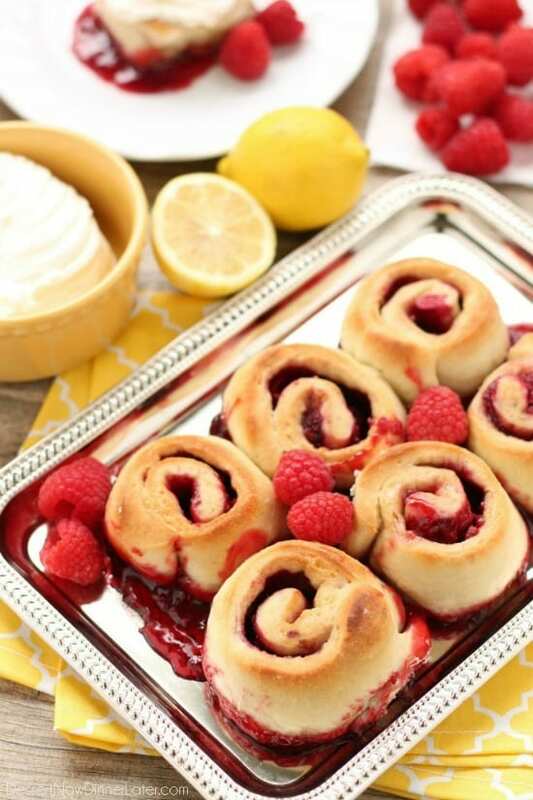 Raspberry Lemon Rolls - Dessert Now, Dinner Later! 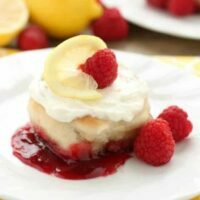 Sticky Raspberry Lemon Rolls are made easy with frozen dough and are topped with a sweet and citrusy lemon cream cheese frosting. If there is one berry I love above all the rest, it is raspberries. I like that they are tart, yet sweet, and wonderfully fruity. When I buy them, I hoard them to myself. It’s like hiding chocolate from my kids. Raspberries need to be appreciated like fine chocolate. If you know me, I RARELY use fresh fruit in baked items. Unless I get a killer deal, I don’t want to ruin ripe fruit by changing it in a recipe. I like to eat it as it is, fresh and juicy. 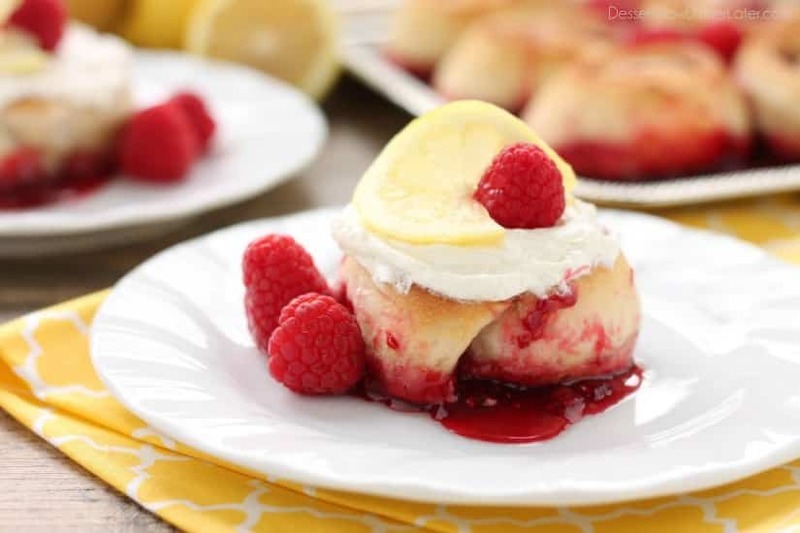 So this recipe actually uses frozen berries, and frozen dough. It’s been a LONG time since I’ve made bread myself. Well, actually, I mixed some Lion House Rolls together last month one Sunday just to use up a mix that I’ve had in my pantry for over a year, which actually only had like flour, milk, sugar, and dough enhancer (or something like that) in it. I totally shouldn’t have spent $5 on that box. I only bought it because I had a gift card to use, oh well. Anyway, I just love Rhodes frozen dough, which is what I used for these rolls! It saves me the floury mess of making dough myself. I make pizza with Rhodes dough at least twice a month. It’s great for sweet or savory recipes. In fact, we use it so much, that my son thinks ALL rolls are Rhodes rolls, and when his friends at school haven’t heard of it, he gets really upset. Haha! It’s cute actually. 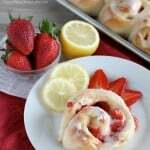 I first made these raspberry lemon rolls for Easter, and knew I had to share them with you all! 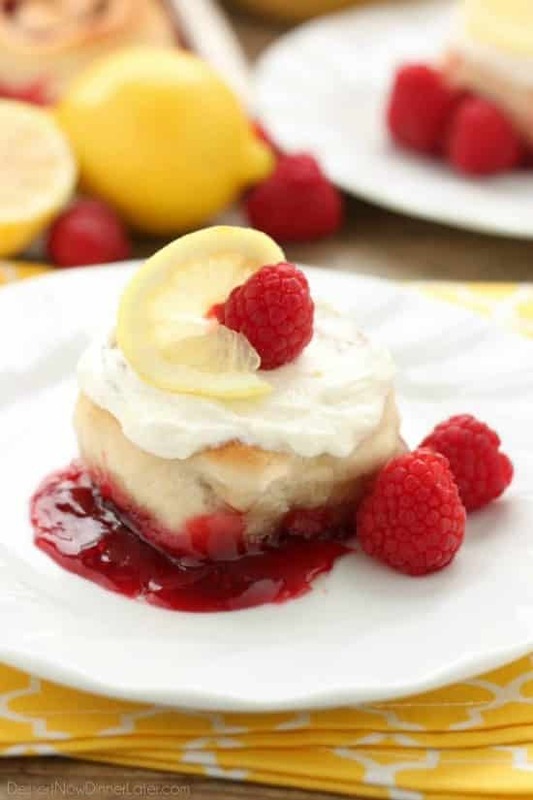 The bottoms get all sticky with the raspberry filling, and I made a citrusy lemon cream cheese frosting to go on top. It’s a wonderful combo! I’m sharing the recipe over on the Rhodes blog today. Go check it out and make these asap! Roll the dough into a large rectangle about 12-inches wide by 18-inches long. Smear the softened butter on all but one of the long edges. Sprinkle the brown sugar on top of the butter and spread it with your fingers to cover the butter. 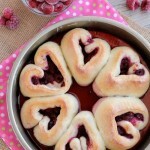 Roll the dough from the long end with raspberries towards the long end that was left bare. Pinch the seams and place the roll seam side down. Using floss, cut the rolls into 12 even pieces. Tuck the floss underneath the dough, then criss-cross the floss and pull outwards until it cuts through. Dip the floss in flour if it sticks to the dough. The floss helps cut the rolls without smashing them. Place the rolls inside of a greased 13x9-inch baking dish. Press the tops gently to flatten the rolls slightly. Then cover with greased plastic wrap and allow to rise until double in size, about 1 hour. 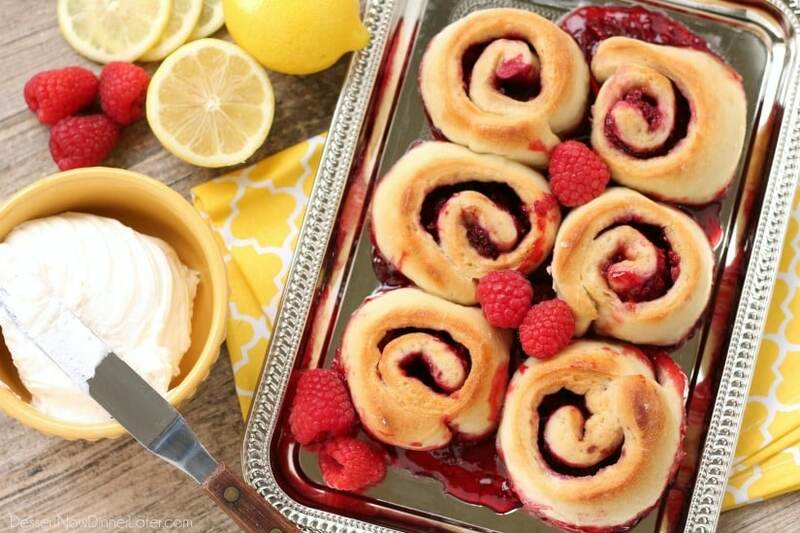 Raspberry juices will ooze out of the rolls, and that's okay. Bake at 350 degrees Fahrenheit for 20 to 25 minutes or until golden brown on top and the dough is cooked in the center and on bottom. Allow the rolls to cool slightly. 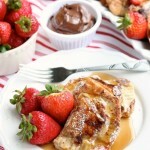 Those look like a perfect weekend breakfast! Thanks Roxana! They definitely are!